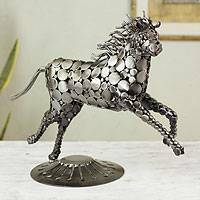 Stampeding across the open prairie, a wild horse takes shape from recycled metal. Metal bits left from a die cutter are transformed into art in a very original sculpture by Armando Ram�rez. It stands on a clutch diaphragm. Ram�rez does not give his sculptures a fine polished finish, therefore smudges and scratches may be present. 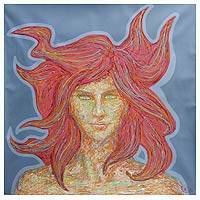 Her fiery hair dances like embers around her porcelain face as Bruno Ccopa pays homage to feminine beauty through his art. Painting with acrylics, Ccopa creates a bold and powerful composition. 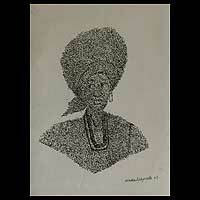 Titled “Mujer et�rea” in Spanish. Ripe, sweet and succulent, pears are tempting against a sapphire background. 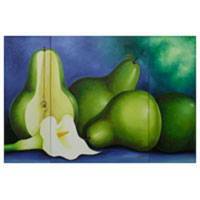 A white calla lily accompanies the delicious pears as Mariana Gonz�lez acknowledges the influence of Mexican artist Diego Rivera in her work. Painting with acrylics, Gonz�lez creates the composition over three canvases of different size. Titled “Peras II” in Spanish. Vibrant red and fertile green punctuate a rug of rich earth colors. 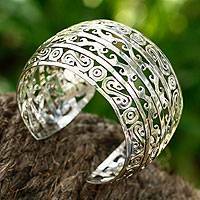 Designed by Kavita, the dhurrie is a superb example of India’s traditional arts. 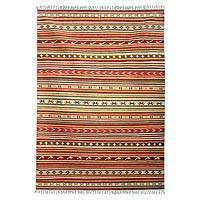 It is woven by hand of virgin wool, and it can take up to 5 days to complete. Clear sunlight floods a mountain landscape, illuminating the crystalline air and caressing sparkling waters. Reflected there, clouds mingle with verdant trees in a riot of lucid color. 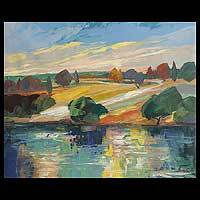 Flor Pachas depicts a highland scene where lush trees flourish on a riverbank. Titled “Reflejo en l�cidos” in Spanish. Shooting upward, rising and falling, undulating like flames, this sculpture represents the power of a mighty wind. 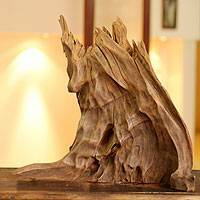 This exquisite sculpture is born of the natural shape of aged Indian sal wood. Suresh Pant releases the images he perceives there. “In the morning when I wake up and see the sky, I feel charged with energy by the fresh new day, ready to tackle anything,” says Puntip Fooyat. 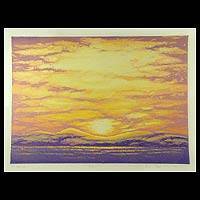 Sunrise protagonizes this exquisite woodcut print. Golden rays playing across a wide expanse of violet fields suggest good overcoming evil in the artist’s mind. 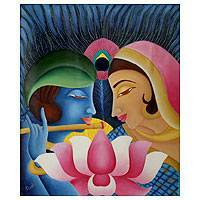 Neelam Gupta conveys the inspirational love shared by Radha and Krishna in this evocative painting. The Hindu lord and his beloved are youthful, blissful. He plays his flute as a lotus blossoms between them and a peacock feather shelters the couple. 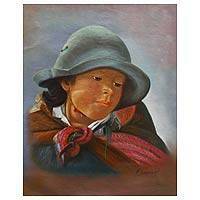 Painting memoirs from his travels across the Andean highland, Fernando Sayan Polo evokes the presence of a young girl in a grey hat. Held tight under her cheek with colorful ribbons, she keeps warm with a poncho tied around her shoulders. Blushing cheeks bring color to her innocent expression. Working with oils, the Peruvian artist paints with admirable realism. Titled “A�oranza” in Spanish. 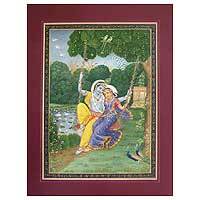 The love between Lord Krishna and Radha exudes from this composition by India’s Nand Kisore. He obtains color from crushed gemstones to paint the lovers’ vivid portraits as they sit on a swing. 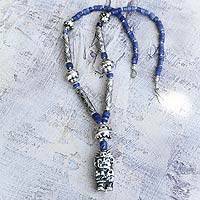 Painted in blue to tell of his divine nature, Krishna is a beloved deity, and although many women fell in love with him, only Radha captured his heart. Features a card paper mat. 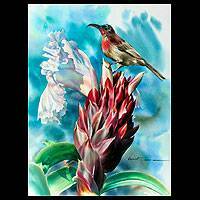 Perching in a crape ginger plant, a colorful bird gazes at the sky. Thai artist Seksan Sing-on demonstrates his absolute mastery of realism with this exquisite nature study. He works in watercolor. “This folding table is inspired by the tables that vendors use to sell their wares in the streets of Guatemala City, even on our own famous Sixth Avenue,” say Hubert and Ana Claudia. 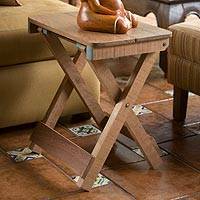 “It is a beautiful table filled with Guatemalan tradition and history.” The table’s legs are carved from cedar and the top from machinche wood. They are all held in place with thick steel wires and bolts, like the ones used in construction. “We wanted to preserve a rustic look for this table, which is why we kept the colors on the ends of each piece of wood: it was put there by our suppliers because that’s how they identify each wood’s thickness.” Not for outdoor use. 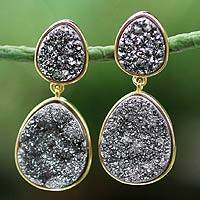 The dark mystery of drusy agate makes these earrings fascinating. 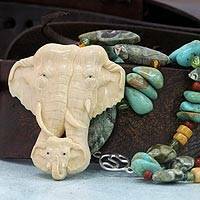 From Novica’s Gemstone Jewelry of Southern Brazil collection, the design is bathed in 18k gold. 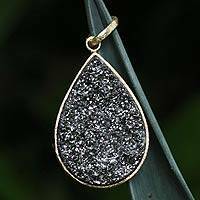 Sparkling drusy agate forms a mysterious black teardrop. 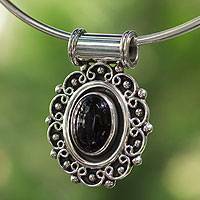 From Novica’s Gemstone Jewelry of Southern Brazil collection, the dazzling pendant is bathed in 18k gold. 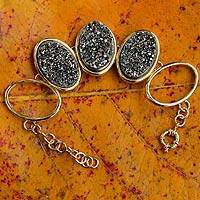 Dark as a shadow, sparkling drusy agate is enchanting. 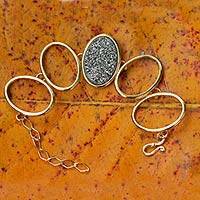 From Novica’s Gemstone Jewelry of Southern Brazil collection, this contemporary bracelet is bathed in 18k gold. 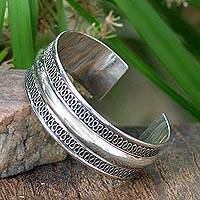 Money Clip is available from jewelbasket.com. Buy now and save. 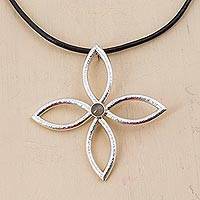 Jewelbasket offers the best value on , jewelry and gifts. 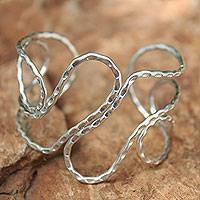 Girl Charm is available from jewelbasket.com. Buy now and save. 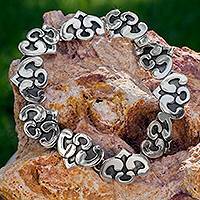 Jewelbasket offers the best value on , jewelry and gifts.